A Windows application to quickly and effectively manage your CRELoaded-based online store. Store Manager for CRELoaded is a Windows application to quickly and effectively manage your CRELoaded-based online store. You can add, delete and update products, categories and manufacturers, automatically upload your product images while editing products, categories, manufacturers, view reports, orders and keep the track of your online sales. All this from your desktop computer. 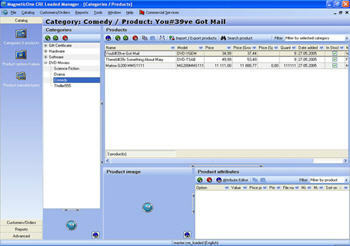 MagneticOne CRELoaded Manager was made for ordinary users not for computer specialists, only few settings required for program to start and it just works. Add, delete, modify products, categories, product manufacturers, product options. View, edit, print reports, invoices. Easy product navigation, quick search, filters. Image management functions (require properly configured FTP). Extended attribute editor with download attributes - quickly manage product attributes. Instant changes - all changes you made applied to your store immediately, no synchronization, no delayed updates. User friendly interface. Only few required options - you have to work with your store but not waste your time investigating the program. Product copy/paste feature - easy move products between categories and stores! SSH support - for secure connections. Simple and quick installation. Just run installer and click Next several timer, no unintelligible options and parameters, no stupid questions. Easy registration procedure. You do not need to litter your head with serials or other stuff, just input your name and click OK button, that's all. Direct connection to the MySQL database (no additional php modules or server changes needed!). Multiple stores management. Store your configuration data and quickly switch between stores. Database backup/restore - keep your data safe. Store configuration - edit all store settings in one window. Should be used by advanced users who really know what they doing. Encrypted passwords for increased security. Store Manager for CRELoaded is a Windows application to quickly and effectively manage your CRELoaded-based online store. You can manage CRE Loaded products, CRE Loaded product attributes, categories, manufacturers, orders and other things. 2P Label Designer - A powerful yet very easy-to-use professional Barcode Label Design software specifically for predefined off-the-shelf labels. BarcodeAnywhere - A very powerful yet very easy-to-use barcode creator software which allows you to create barcode images in three basic ways. miniMRP - miniMRP 2.0 for Windows 95/98/Me/2000/XP is a new, easy to use inventory control program with some additional features usually only found in larger ERP/MRP systems. X2Net SmartAddress - A wonderful contact management utility that can help you manage, build and consolidate all your contact information efficiently. Gas Mileage Tracker - Gas Mileage Tracker can be used to track MPG for cars or other vehicles.